This is one of those meals that was created during the panic mode of needing something to feed my family for dinner that they would like, that I had the stuff for, and that would be super fast to make. (Can’t everyone relate to that?!) I swear, come 4:30pm at our house my kids start to slowly transition from sweet and fun into HANGRY. So if I don’t have some sort of dinner prepped by then, I’m in trouble. I can always fall back on a tasty “wrap” idea on days like this. You can see all of my wrap recipes here . I have a lot of favorites :-). 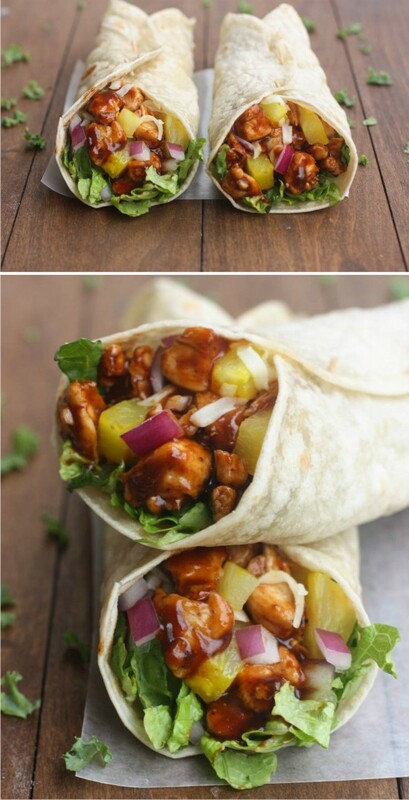 And let me tell you, these Hawaiian BBQ Chicken Wraps are just as delicious as they look. You could have them fridge to table in 20 minutes or less. Perfect for an easy weeknight meal or even for lunch. Heat oil in a large skillet over medium high heat. Add chicken pieces to the pan and season with salt and pepper. Cook, flipping once until chicken is cooked through and golden brown. Remove pan from heat. Add barbecue sauce to the pan and toss chicken to coat. Place tortilla on a plate. Layer with a spoonful of barbecue chicken, cheese, pineapple, onion, chopped romaine and cilantro. Roll, burrito style and secure with a toothpick. Serve immediately.